Have you noticed that more and more engagement rings rely on clusters of tiny diamonds rather than a pretty authenticated center stone set in a unique design? Often these are less expensive than a single diamond center stone because diamond melee is cheap, ungraded and uncertified. But if you like this look, then by all means find the best you can. 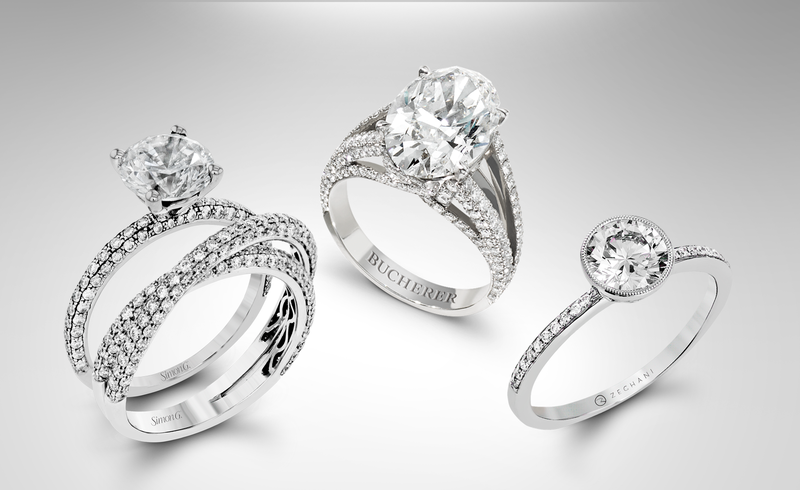 In contrast, http://ringsunique.com/ will search for a lovely center diamond in your budget and set it in a unique design, handcrafted in America only for you. You see, we believe an engagement ring is all about your unique style and unique beauty is primary. From contemporary to vintage, simple to complex, diamonds or gemstones…we can satisfy your wishes. Check out this lovely feminine beauty. 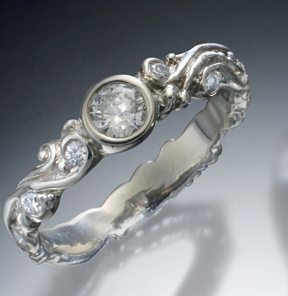 Here a smallish diamond is set in a bezel on a wave style band. Perfect for design and priced at less than $2k. Unique Diamond Ring at Rings Unique!